CERTIFIED VERY RARE JOHN COOPER WORKS PACKAGE -- LEATHER -- HARMON KARDON SURROUND SOUND -- CLEAN CARFAX! 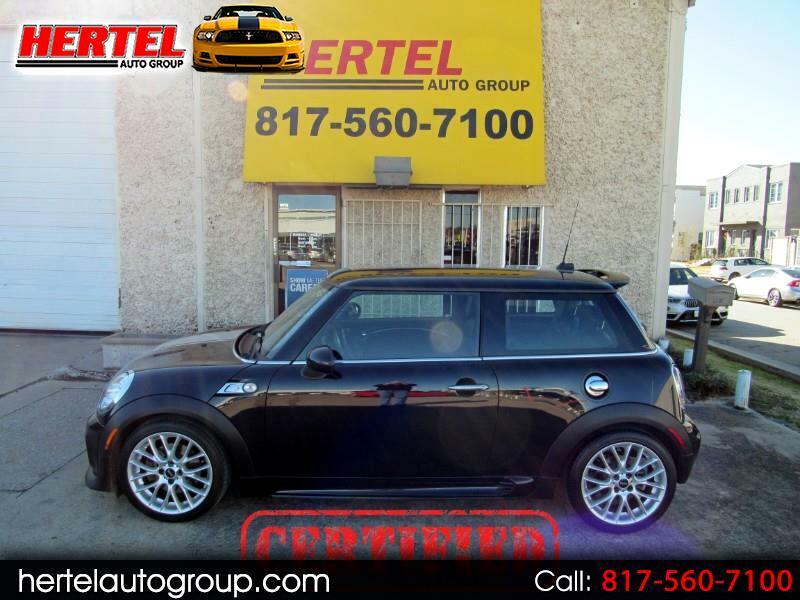 Hertel Auto Group is pleased to offer this extremely hard to find, Texas-Owned 2013 MINI Cooper Coupe S with the legendary John Cooper Works Package. According to Wikipedia, John Cooper Works (JCW) is an English company based in Farnborough, Hampshire which was founded in 2000 by Michael Cooper, son of John Cooper, the racing car maker and tuner responsible for the original MINI Cooper. These days, JCW produces tuning parts and accessories for the MINI. Offering an Automatic Transmission for the first time on the more powerful JCW Package, the 2013 Edition of the MINI Cooper Coupe also added Bluetooth as standard equipment. Compared to the Mini Cooper, the Coupe is a 2-seater with a raked-back windshield and tapering hatch. It sits a little lower and by that virtue, has a more athletic stance that gives it the appearance of a Track-Ready Road Racer. On the road, this Cooper S with the JCW Package boasts a stout 1.6-Liter Turbocharged 4-Cylinder engine. In a "Base" S Package, this resulted in original factory specifications of 181 Horsepower and 177 lb ft of torque. The JCW Edition cranks up the Turbo Boost for 27 additional ponies (up to almost 200) and a total of 192 lb ft of torque while still returning up to 34 mpg on the highway. For those who enjoy a spirited stoplight sprint, you'll be rewarded with 0-60 times of around 6 seconds. Mechanically, it starts, runs, drives and performs exactly like you'd expect it to. All four 205/45ZR17 tires mounted on OEM 17" Alloy Wheels are in good to very good condition. On the outside, this rust-free JCW Cooper Coupe sports an stealthy Midnight Black Metallic (Code A94) Paint Scheme exterior that is complimented by a Black Leather interior. The Sport Stripes, Aerodynamic Body Kit and Bi-Xenon Headlights add to its race-ready-looking appeal. Inside, this Cooper S JCW Coupe has an array of amenities that include Leather Seats; Upgraded Harmon Kardon Surround Sound Audio System; a Leather-Wrapped Steering Wheel with Audio Controls; Power Windows, Locks & Mirrors; Cruise Control; Keyless Entry; AUX and USB Inputs; Bluetooth; Automatic Climate Control; Fog Lights; Cold A/C and more. As with any pre-owned vehicle, it does have the usual amount of cosmetic imperfections that are inherent to a vehicle of this age and mileage. We invite you to view all of the photos that are available on our Web Site and determine for yourself if it meets your expectations for a vehicle of this age and price. If it does, we then welcome you to stop by for a viewing and test-drive of this good-looking 2013 MINI Cooper Coupe S John Cooper Works. Given its scarcity; mileage; condition; ownership history and options, we've priced it competitively in the marketplace and expect it to sell quickly. Don't let this premium MINI pass you by! Certified Plus Coverage includes major components of the Engine and Transmission, as well as A/C Compressor; A/C Condenser; A/C Evaporator; Radiator; Water Pump; Thermostat; Alternator; Starter Motor; Power Steering Pump; and more. Service Work can be done at any MINI Dealership or ASE-Certified Mechanic. See Dealer for More Details & Upgraded Coverage Options!